MultiMediaCard is the smallest, high-capacity memory card currently on the market. About the size of a postage stamp, MultiMediaCard is the perfect solution for storing extra files with portable devices like digital cameras/camcorders, audio players, and smart phones. Show Your Digital Photos Right On Your TV! Reads JPEGs up to 19 MegaPixels! 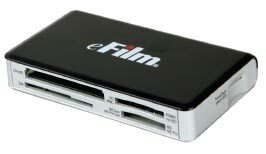 Conveniently and economically adapts Memory Stick, Secure Digital, MultiMedia and Smartmedia cards to your PicturePAD CompactFlash slot.